President Cyril Ramaphosa made it on to the Time100 - a list of the most influential people in 2019. Listed in the "Leader" category, he keeps company with Imran Khan, US president Donald Trump and Catholic Pope Francis. He is described having "perfected the art of patience" in a mini biography by Vivienne Walt. "Raised in the township of Soweto, he honed his political skills helping his country navigate its way out of apartheid," Walt wrote. "Then, when he was sidelined for the presidency in the 1990s, he harnessed his cunning and gregariousness to make a vast fortune in business, while his rivals sank the country into dysfunction and cronyism. "Now finally, at 66, Ramaphosa, or Cyril, as he's known to South Africans, has the chance to end corruption and grow the stalled economy." Walt notes this could be his "toughest battle yet" with "blackouts, grinding poverty and massive unemployment" leaving millions desperate for quick results. "Vicious infighting in his African National Congress party leaves him vulnerable to a coup, or perhaps an ouster in elections on May 8. For all that, Ramaphosa has kept his characteristic chuckle and his knack for focusing on the bigger picture." Walt quoted him as saying "Unity was never going to happen overnight". "After a lifetime fighting his enemies, he should know." 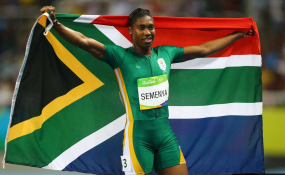 Caster Semenya made the list of Icons as reported by Sport24.